All work is gendered and all work is embodied. Yet, in common with so many features of social life, these connections have remained largely unnoticed in most areas of social enquiry. All three topics - gender, bodies and work - have their own history and theoretical concerns and have recently showed signs of convergence. This volume recognizes this convergence and explores the inter-connections more specifically. The authors provide a set of questions which draw together themes already present in existing studies and which provide the basis for further analysis and theoretical elaboration. The chapters explore processes of embodiment and disembodiment within working settings and discuss the implications of these for the construction of gendered identities. Enhancing our knowledge of all three terms, Gender, Bodies and Work develops a perspective that has considerable potential both for assessing the past and exploring the future. 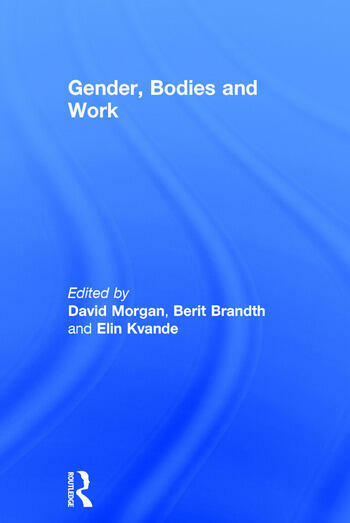 Contents: Thinking about gender, bodies and work, David Morgan, Berit Brandth and Elin Kvande. Theorising Gender, Bodies and Work; Gender, Bodies, Work: Re-reading Texts, David Morgan; Embodying emotional labour, David Knights and Torkild Thanem. Embodying Gendered Labour; Gendered bodies and boundary setting in the airline industry, Ulla Forseth; Gut feeling, back-slapping - gendered embodiment on the exchange, Bente Rasmussen; Embodying male workers as fathers in flexible working life, Elin Kvande; The gendered embodiment of agricultural work: nature, machinery and patriarchy, Berit Brandth and Marit S. Haugen; Embodied gender talks - the gendered discourse of tiredness, Karin Widerberg. Gender and Body Work: Gender and care: the role of cultural ideas of dirt and disgust, Lise Widding Isaksen; Men, bodies and nursing, Rannveig Dahle; All foetuses created equal? Constructing foetal, maternal and professional bodies with obstetric ultrasound, Ann Rudinow Soetnan; Lonely heroes and great white Gods: medical stories, masculine stories, Kathy Davis. Index. David Morgan is from NTNU in Norway, Keele University in the UK, and is Professor Emeritus at Manchester University, UK. Berit Brandth and Elin Kvande are both Professors of Sociology in the Department of Sociology and Political Science at NTNU, Norway.